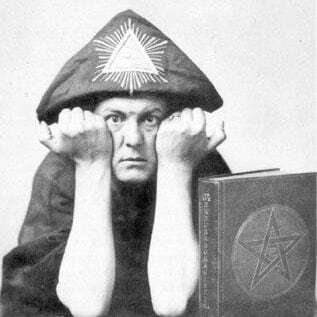 Who really was Aleister Crowley? Since 2012 I’ve been immersed in studies of Jewish mysticism and ceremonial magick. I absolutely love it. It’s a fascinating, endless stream of information and mastery. Maybe it’s because I’m a Scorpio and I just gravitate towards mysteries in general; it’s certainly a natural progression from being a white witch for 30 years… plus I love Led Zeppelin. That’s a question that brings a multifaceted answer. There’s a lot of rumors and wild information out there that come from anxious minds with unsubstantiated stories. What I’ve personally found is that studying Magick isn’t evil, and neither was this guy (although William Butler Yeats did think he was nuts). “Edward Alexander Crowley was born on 12 October 1875 to a well-off family of Plymouth Brethren in Leamington Spa. He was a willful child, and his mother nicknamed him Therion, the Great Beast 666, from the Book of Revelation. After school, Crowley went to Trinity College, Cambridge, to read natural sciences. He devoted little time on his studies, and excelled instead at chess and mountaineering. At 22, he decided all was worthless except magic and the occult. He changed his name to the Celtic-sounding Aleister, and spent his spare time writing poetry. He left Cambridge with no degree and moved to London, where he joined the Hermetic Order of the Golden Dawn. There he met and fell out with the poet W B Yeats, who memorably described Crowley as “an unspeakably mad person”. Armed with rituals from the Golden Dawn, Crowley moved to Boleskine House on Loch Ness, where he tried to work a summoning ritual for his guardian angel. His work was interrupted, and after a stint mountaineering and meditating in Mexico, he came to believe he was the reincarnation of the Elizabethan alchemist Edward Kelley, who had acted as a medium in the “spiritual conversations” of the polymath Dr John Dee. In 1903, Crowley married Rose Edith Skerrett, and while on holiday with her in Cairo, started receiving dictation from a spirit named Aiwass. He wrote for an hour a day on 8, 9, and 10 April 1904, completing the manuscript’s three chapters in as many days. The result was The Book of the Law, or Liber AL vel Legis, and it announced the end of the Christian era, and the start of the Æon of Horus. It is the central text in the practice of Thelema, whose guiding tenet is, “Do what thou wilt shall be the whole of the Law”. Although Crowley was the first to formulate Thelema into a set of beliefs, the idea originated in Rabelais’ 1534 book, Gargantua, in which the eponymous monster built the anti-church Abbey of Thélème. Over the coming decades, Crowley developed his experience of magic, the occult, drugs, and sexual liberation, earning a reputation as “the wickedest man in Britain”. He wrote poetry, articles, and books prolifically, but spent all his inheritance and earnings on his experimental lifestyle. He died, penniless, in Hastings on 1 December 1947. Crowley’s memory was resurrected in the 1960s, when he became a cult counterculture figure, featuring as one of the faces on the album cover for the Beatles’ Sgt. Pepper’s Lonely Hearts Club Band. In 1970, Led Zeppelin’s guitarist, Jimmy Page, purchased Boleskine House, which he owned until 1992. This entry was posted in Celebrity charts, Magick and tagged Aleister Crowley, Magick, OTO, spirituality, Writing on April 11, 2017 by LizRose93. Thanks for the detailed information! I am a Crowley fan — although he made some mistakes, just like all of us 🙂 He is certainly a great influence and an interesting person. I am also a Zep fan, love them!